I attended the Feis Teamhra: A Turn At Tara event at Tara yesterday. It was held in the church at the site as the weather was unsuitable for outdoors. The church was full and the crowd appreciated the mix of poetry, music and song. I was particularly interested in hearing poets Paul Muldoon and Michael Longley and they didn't disappoint. It's great to hear them together because they in a sense represent two different strands, generations even, of northern Irish poetry. Longley is the supreme lyric poet. He read in two sections, the first mostly Carrigskeewaun poems - based on or about the Mayo townland where he holidays every year. He included some which were written for grandchildren including Remembering Carrigskeewaun. In his second slot he included poems based on The Iliad and finished with the well-known CeaseFire. You can hear Longley read both poems on this page of the Poetry Archive. Muldoon on the other hand has moved beyond the lyric and has recently written sequences which play with poetic forms and language. He read from his The Old Country sonnet sequence from his recent Horse Latitudes volume. He introduced it as a place where words don't mean what they appear to mean and have little to do with the truth. (I paraphrase). Muldoon's reading style is slow, dry, almost monotonous but suits the material perfectly. In LitLab we had a workshop on reading poetry aloud at one stage and Muldoon's reading style was played as an example of how not to do it. In fact his reading has a wonderfully mesmeric quality to it. Is he taking it seriously? 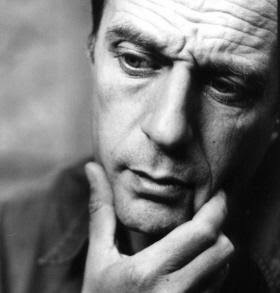 There's a link to the poet reading a number of his poems on Paul Muldoon's homepage. 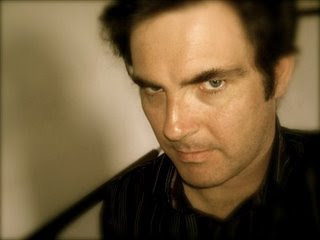 I'm looking forward to hearing another northern poet, Tom Paulin, (though he was born in Leeds) who could not be described as a lyric poet, in Farmleigh on Tuesday evening. The singing and music was also enjoyable especially the harp playing of Mayo-born Laoise Kelly. she played Carolan's Planxty Wilkinson, written for a family who lived close to Tara. The church actually has a memorial plaque to members of that family. or even on the internet so it must be true. The Bob Dylan SatNav story has been doing the rounds of newspapers and internet sites recently. Here in the Guardian and here in the Telegraph. I've got jokey texts like "I presume you're going to buy a new SatNav system soon". All based on what appears to have been merely a joke by Bob on his radio show. The truth (possibly) here. 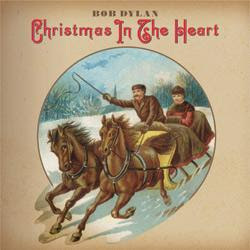 It is true however that Bob is releasing an album covering Christmas songs to be released on October 13. It's called Christmas in the Heart. All royalties go to charity. Details here. An evening of poetry in Farmleigh by renowned poets Tom Paulin (right) and Jamie McKendrick - introduced by Stella Tillyard – author of “Aristocrats”. Tom Paulin and Jamie McKendrick will read from recent and collected works to an audience in the Ballroom of Farmleigh and there will be an opportunity for lively discussion during the evening. Tom Paulin was born in Belfast in 1949 and is now a fellow of Hertford College, Oxford. He is the author of numerous poetry collections, plays and books of non-fiction, many of which reflect upon the political situation in Northern Ireland. Tom is also an frequent contributor of BBC 2’s Newsnight Review. Jamie McKendrick was born in Liverpool in 1955 and now lives in Oxford. He is the author of 5 volumes of poetry, most recently “Crocodiles and Obelisks” and of many translations from Italian. Jamie has just finished a translation of the poetry of Valerio Magrelli. Date: Tuesday 1st of September. Location: The Ballroom, Farmleigh, Time: 8pm. You have to book tickets on www.farmleigh.ie. Not many writers of note are buried in Glasnevin. Brendan Behan is but his reputation seems to decline year by year, not unjustly I think. The most famous writer buried there must be the English poet Gerard Manley Hopkins, who became a Catholic convert and a Jesuit. He is buried in the Jesuit plot. His name is the first on the left on the second step on the main monument. In 1884 he became professor of Greek literature at University College Dublin and spent an unhappy time in Dublin. During this time he wrote what came to called the "terrible sonnets". He died of typhoid fever in Dublin in 1889.
from the sonnet No Worst There Is None. The Dublin Theatre Festival this year includes a show about Hopkins' stay and death in Dublin entitled No Worst There Is None. "This site-specific promenade piece staged in the magnificent surrounds of Newman House conjures the nightmare world of the seminal Victorian poet Gerard Manley Hopkins, as he moves towards death. Set in the very house where Hopkins died in the 1880’s, No Worst There is None is a ground-breaking fusion of contemporary choral music, poetry and performance." The bad news is that when I phoned to book a ticket I was told that the show sold out very quickly and I was put on a waiting list. Maybe it will be extended or put on again after the Festival. Last evening I drove to Celbridge to see Jonathan Swift try to explain his relationship to the two women in his life, those he called Stella and Vanessa. Swift himself often made the same journey on horseback to visit Vanessa who resided for a time at Celbridge Abbey while he was in residence at Laracor, Trim. Trim-born author Pat Dunne (right) has written "Only a Woman’s Hair" a thirty minute piece named after a lock of hair which was found in Swift’s desk and thought to have come from Stella. He originally performed this at the Trim Swift Festival but I didn't see it there because we were part of the same entertainment. He performed it last night in The Mill, Celbridge as a Heritage Week event. Pat Dunne himself is originally from Trim but now resides in Celbridge. There has been much speculation and many books written about the relationship - Did Swift marry Stella in secret? did he father a child: Was he homosexual? Was he Stella's cousin or even half brother? etc. Pat deals with all the speculation as the Dean and leaves us in no doubt as to his real feelings but then appears to get caught by surprise at the end by the lock of hair and by a last letter from Vanessa. The performance was dramatic and engrossing and left me with the desire to read more about Swift and the women. Leinster Leader notice of the event here. Recent Meath Chronicle interview with Pat Dunne here. An 1852 New York Times article entitled The Armours of Dean Swift (originally from the London Times) available here as a pdf. Labels: Pat Dunne; Jonathan Swift; Only a Woman's Hair; Celbridge; Stella and Vanessa. As part of Heritage Week Glasnevin Cemetery guided tours are free all this week at 2.30 and 7.30. I took one yesterday never having actually explored the cemetery. Our guide was Shane MacThomáis who has been the resident historian and tour guide to Glasnevin Cemetery for over ten years. He was excellent, very knowledgeable and very witty. He showed us many of the more important graves, DeValera, Parnell, Collins, O'Connell but also told us a lot about the history of the place and the current plans for renewal and for developing it as national monument. A new history and interpretative centre is being built and should be open next Easter. The whole cemetery is being restored to the state is was around 1900 - a fine Victorian-style garden cemetery with manicured grass and carefully cobbled paths flanked by well-pruned hedges. 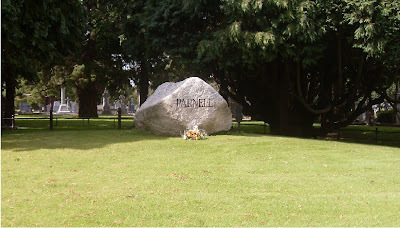 I was most impressed with the Parnell headstone, set apart in a grassy circle, Wicklow granite and just the single word. Just like the man himself I think. The DeValera and Collins monuments are very modest, the Dev one in particular is a regular small family headstone in a row of similar monuments. Not far from the Collins grave is Kitty Kiernan's resting place - with her husband. She died twenty three years after Collins, of cancer. There are about one and a half million people buried in the cemetery though most of these have no headstone or marker. The cemetery does have a record of every burial since its foundation and these are being put on the internet. There is a charge for looking up burials. There are still about two thousand plots available to purchase in the cemetery. They cost from three thousand euro to around forty thousand euro depending on location. Yesterday I drove through the small town of Markethill, Co Armagh on the road from Newry to Armagh. 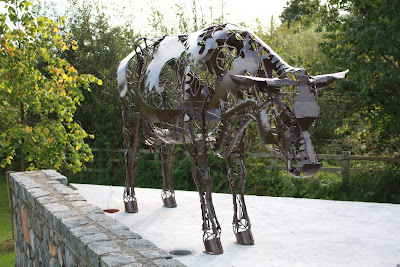 I was struck by some magnificent public sculptures of cows in the town. I didn't stop to explore further or take photographs but a little internet research has come up with some pictures and the information that the animals are by Northern Irish artist Kevin Killeen. His web page from which the picture above comes is here. There's another picture of one of the sculptures here. This week is Irish Heritage Week. It runs from the 22nd to the 30th of August. In Ireland Heritage Week is co-ordinated by the Heritage Council with support from the Department of Environment, Heritage and Local Government and Fáilte Ireland. There is something taking place in every county and most activities are free of charge or offer great value for money. You can search the website for events by county, by event type and by date. Two event of note in Meath next Sunday - pity about the clash. 'Ledwidge Day' A Celebration Of The Life & Poetry Of Meath Poet Francis Ledwidge takes place in Townley Hall on the Slane road out of Drogheda at 3pm. Event Description: Family event with music, poetry reading, lecture, children's story telling, art workshop for children and magician show. Trim poet Tommy Murray will take part. And Feis Teamhra: A Turn At Tara takes place at the Hill of Tara Visitor Centre at the same time. Pulitzer prize winning poet Paul Muldoon will recite poetry along with poet Michael Longley, and music from Grammy award winner Susan McKeown with Laoise Kelly, Steve Cooney, Aidan Brennan and more to be announced. Admission: Free. 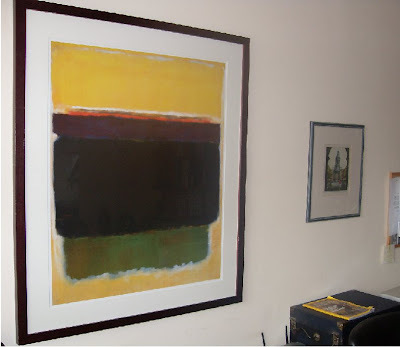 It's only a print of a Mark Rothko painting of course and not mine actually, just on loan from Blanchardstown Library. 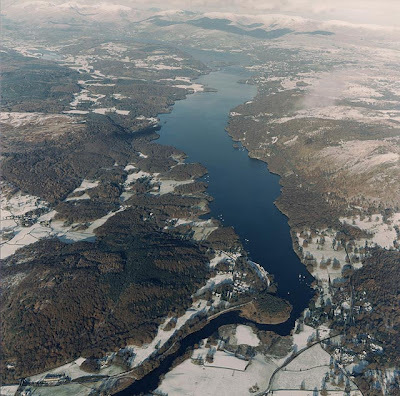 They have a selection of framed prints which can be borrowed for two months. I visited the Rothko exhibition in the Tate Modern last January and was very impressed but the huge paintings. The limited use of colour and the basic shapes makes it all the more mysterious. Like using a very strict form in a poem I suppose. This painting is called Untitled 1954. That doesn't sound correct. Maybe it should be "This painting is untitled and was created in 1954". Confusing! Great quotations from the painter here. My favourite today is A painting is not about an experience. It is an experience. You could adapt it and say: A poem is not about an experience. It is an experience. This print temporarily replaces the Patrick Collins print of Travelling Tinkers which I bought in the eighties at the major retrospective in the Municipal Gallery, Dublin, now the Hugh Lane Gallery. Collins was born in Sligo of course, Rothko in Russia. 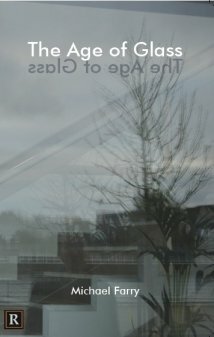 Someone has invented a poetic form called a Rothko - it's true check it out. 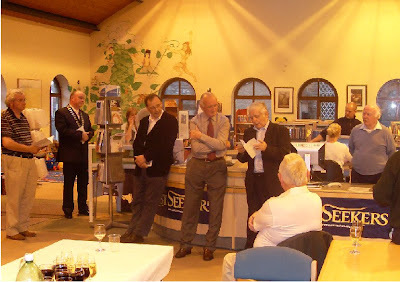 I attended the launch of Tommy Murray's book of poetry Counting Stained Glass Windows last evening in Trim Library. A very well attended event with a large group from Meath Writers Circle there as well as some from our own Boyne Writers Group. 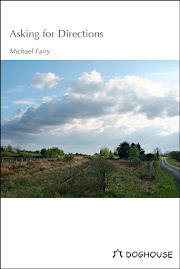 The book is published by Lapwing Press, Belfast. Master of ceremonies Michael Regan praised Tommy for his long devotion to poetry and local history and congratulated him on the new book. Members of the Writers Circle read poetry and in some cases sang songs - we had a lively rendition of The Red Flag by Michael "Sheriff" Shiels. The Red Flag was written by a Meath-man of course, Jim Connell from Crossakiel. Frank Murphy and Willie Hodgins also read poetry. The book was officially launched by award winning poet (Forward Prize 2002) Tom French who praised Tommy Murray's craft of poetry and highlighted in particular his attitudes of devotion and of rebellion, comparing these to the work of poets Philip Larkin and Michael Hartnett. Tom's new collection is being published by Gallery Press in September. Drogheda poet Marie MacSweeney was also there and read from her forthcoming poetry collection which will be launched in the Boyne Valley Hotel, Drogheda on Friday, October 9th at 8pm. 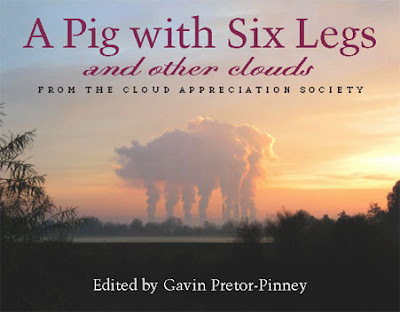 from the website of The Cloud Appreciation Society as is the book cover above. Lots of cloud poetry on the site. The Over the Edge New Writer of the Year long list of sixty of the 324 entries was announced yesterday and published on the website. One of my pet complaints is competitions that never publish results on the internet so Over the Edge is to be commended on the speed with which they make their lists and results public. Two members of Boyne Writers on the list, Brendan Carey Kinane who won the Boyle Poetry Competition in 2007 and Evan Costigan at present spending a year in Japan. Well done! Some other well know writers on the list, some of whom we have published in Boyne Berries over the last few years including Patricia Byrne, Jane Clarke and Nollaig Rowan. The short list will be announced at the Over The Edge: Open Reading in Galway City Library on Thursday, August 27th and the winners will be announced at the reading on Thursday, September 24th, 2009. Obviously my long 90 line poem didn't make an impression with the judge. Ah well there's always next year. Back to three short lyrics! 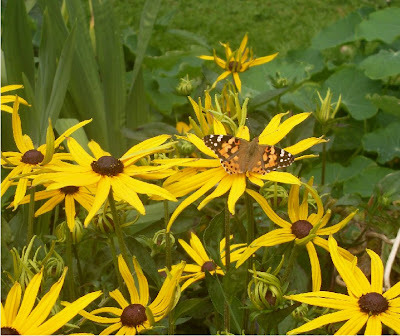 At last a Tortoiseshell butterfly in the garden. Three or four there yesterday. Maybe the Rudbekia which has just begun to flower attrected them. Someone called Morrisey has a song called Black-Eyed Susan also. Recently his mind’s not on it. That's the ending of a poem I wrote about the Manchester United Munich crash from the point of view of a west of Ireland lad who started to support them as a result of the crash. In the early years it was a matter of waiting for the reading of the results at 5 o'clock on the BBC - read just like a Catholic litany with different inflections giving a clue as to the result as each first team's score was read. The season has started again and I get the same feeling- I've been following English football since 1958 and maybe it's time to stop, to ignore all the hype and news. Still I watched United yesterday and I have plans to go to Old Trafford and see my first United match. What is so great about sport is the unpredictability. In spite of the money and the dr ugs and the hype and the merchandising anything can happen one the game commences. Who would have predicted what happened at the US PGS Championship last night! Yes I watch some golf also. What really irritates me about sport presentation on TV, especially Soccer and Gaelic Games, is the commentary and the fact that they have to have an assistant to add more comments. I'm starting a campaign for a match presentation without commentary only crowd noises. Those who make the decisions in TV seem to have the attitude that the watcher is a complete idiot and needs to be told not only who and what he/she is watching but also has to be told what to think. When Andy Grey on Sky tells us what is going on in a player's head I really get annoyed. 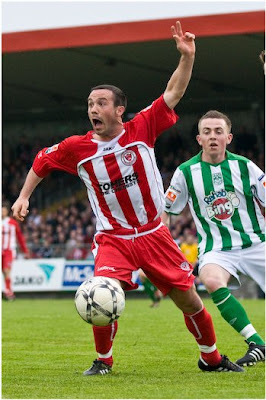 The best result over the week-end was Sligo Rovers 1-0 victory in the FAI Cup. After conceding four goals in each of the two previous matches this was welcome. The scorer was Rafael Cretaro (picture) who sound like he has been bought from Inter Milan for millions but actually the family owns a fast food restaurant in Tubbercurry. Eamonn Sweeney, the Irish writer, in 1997 wrote There's Only One Red Army about supporting Sligo Rovers . What passes as a "Celtic Cross" has been used so much in this country as monument, national emblem and trademark that we forget how interesting, varied and impressive the real thing is. A person needs now and then to actually visit one of the many High Crosses (the correct term) which still exist all over the country. 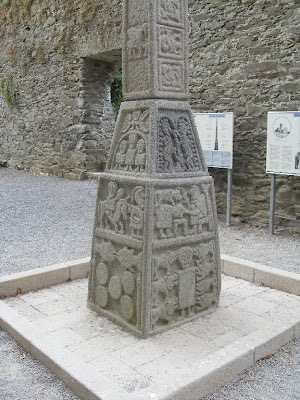 Last week I drove on the N9 through Kildare and took the time to stop and visit the High Cross at Moone. Moone, north of Castledermot (which also has High Crosses), is now bypassed but it is well signposted. The cross here has been well maintained and as well as being one of the finest examples is also one of the more unusual ones. At 5.5 metres in height, it is the second highest cross in Ireland. There can be controversy as to the dates of these crosses but it appears that most High Crosses were erected in the ninth and tenth centuries. The Moone cross is in granite and is made up of a number of pieces. The faces are covered with abstract patterns and fabulous animals and narrative scenes from the bible or the lives of saints. The picture shows two sides of the base with Children in the Fiery Furnace, the Flight into Egypt, the Miracle of the Loaves and Fishes, Adam and Eve, the Sacrifice of Isaac and Daniel in the Lions' Den. Recently I met Drogheda-born poet Susan Connolly at a poetry reading in Kells. Her latest collection Forest Music has a small section of poems based on the Cross of Muiredach at Monasterboice, Co Louth. These are "visual poems" where the shape of the poem becomes an image itself relating to the topic. For instance the first poem in the series has the words arranged in the shape of the cross. Review here. A Large White butterfly in the garden this morning on the dahlia. Apart from the single Painted Lady already blogged about, these Large and Small Whites are the only butterflies I have seen in the garden this year - no Peacocks, Red Admirals or Tortoiseshells so far. 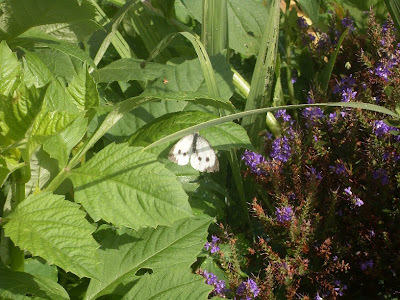 This site is the best I have seen for identification of Irish butterflies and this site is looking for volunteers to monitor the occurrence of butterfly species. Nice poem here if you like John Berryman's work (born John Smith). It's his Dream Song 265: I don't know one damned butterfly from another. This year’s Over The Edge New Writer of The Year competition attracted 320 entries. The competition is open to both poets and fiction writers. The best fiction entry will win €300. The best poetry entry will win €300. One of these will then be chosen as the overall winner and will receive an additional €400, giving the author total prize money of €700 and the title Over The Edge New Writer of The Year 2009. The competition is sponsored by Charlie Byrne’s Bookshop, Kelly Office Supplies, Mary Higgins & "a generous individual donor who wishes to remain anonymous"
The long-list of sixty for this year’s Over The Edge New Writer of The Year competition will be announced in Charlie Byrne’s Bookshop on next Tuesday August 18th at 6.30pm. All welcome. Presumably the list will be put on the website soon after that. I think it was put up the same evening last year. This year's competition judge this year was Patrick Chapman. I was longlisted for this competition last year and this year I decided to send in a long poem or poetic sequence which is too long for most competitions. The rules stated: three poems of up to forty lines, or one poem of up to one hundred lines. 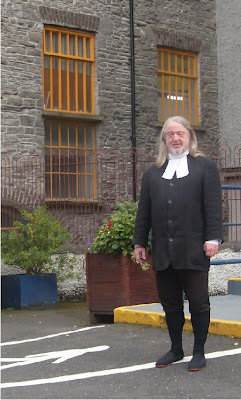 Just now I had a good look at the judge's picture (above) and have come to the conclusion that he'll not be interested in a rambling poem which wanders from Leixlip to Collooney and from 1932 to the present day by way of the Eucharistic Congress. Ah well, there's always next year. 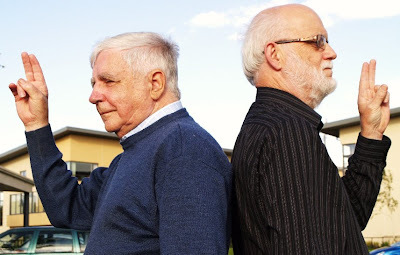 Poet Tom French will launch Tommy Murray’s collection of poetry Counting Stained Glass Windows in Trim Library on Thursday next, 20 August, at 7pm. This the the twelfth book from the pen of the well-known Trim writer and it is being published by Lapwing Press. Local solicitor Michael Regan will be master of ceremonies at the launch and Noel French of the Heritage Centre will say a few words as will Ray Butler of Trim Town Council. Tommy is the man behind the Meath Writers Circle and some members will also read poems at the launch. Tommy has been involved in poetry reading, creative writing classes and collecting and publishing photographs and memories of Trim and Meath. He was a featured reader at one of our recent Boyne Readings and Open Mic. He was captain of the Writers Circle team at the recent Battle of the Books. Above: Publicity photo of myself and Tommy for the event. Counting Stained Glass Windows is a collection of the very best of his poems and should be well worth having. It costs eight euro. I understand that Tom French is having his second poetry collection published in the autumn. 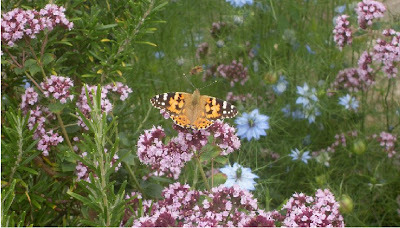 A Painted Lady butterfly in the garden yesterday. The Oregano has grown very well and its flowers attracts more insects than any other flower in the garden at the moment. The blue flowers are Nigella (Love-in-a-Mist) which has self-seeded among the herbs. Some Rosemary front left. Plenty about Irish butterflies on this website. Japenese Anemone provides a welcome area of colour in early August while I'm waiting for the Redbekia, Gladioli and Dahlias to bloom. This plant has been there a number of years and expands year after year. The brilliant white flowers with the yellow tinge at the centre are a nice contrast to the various blowsy summer colours, almost a hint of winter about it. Despite being known as Japanese anemones, the three main species come from China. The Japanese anemone's name comes from the Greek word for "wind," and some other anemone species are called wind flowers. 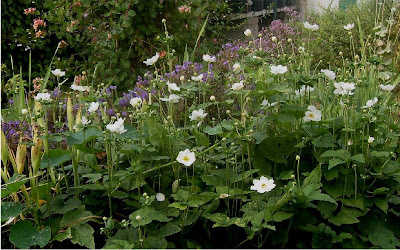 The name windflower is accounted for in several ways, one of which is Pliny's statement that anemone blossoms are opened by the wind. A rich legendary history has gained the anemone many names and attributes. It is said to have sprung from the blood of Adonis; Romans considered it valuable in preventing fever; it has been applied for bruises and freckles; for some it is tainted with evil; and by the Chinese it has been associated with death. And this most poignant poem by German poet Elisabeth Langgässer (1899-1951). The poem, Frühling 1946 (Spring 1946), is dedicated to her daughter Cordelia, who had miraculously survived Auschwitz. In the poem the poet is literally brought back from the realm of death (Reich der Kröte) by the flower Anemone. The translation is by Eavan Boland, and it's from: After Every War, Twentieth – Century Women Poets, Princeton University Press, Princeton & Oxford, 2004. The second lecture I attended last week at the Yeats Summer School was entitled Cuchulain the American by Meg Harper of Georgia State University. She discussed the connection between the myth of the "West" - Irish and American - in the early twentieth century and its influence on Yeats. She pointed out that Yeats based his Cuchulain plays and poems on the book Myths and Folk-lore of Ireland, 1890 by Jeremiah Curtin who was an American folklorist who also specialised in native American folklore. Yeats was an avid reader of Zane Grey and she pointed out two characteristics which set Grey's stories apart from others of the western genre - the inclusion of strong female characters and the reliance on mythic settings. Both are also characteristics of Yeats' Cuchulain works. Another very thought provoking lecture. Imagining Cuchulain as a John Wayne or Clint Eastwood type character seemed a little more plausible at the end than it did at the beginning. Attended two lectures at the Yeats Summer School last Wednesday. The first was by historian David Fitzpatrick (right) who was my PhD supervisor ten or so years ago in Trinity. He is one of Ireland's most distinguished historians with acclaimed publications on Ireland 1914 - 1921, emigration, the Great Famine, labour history, Australian history and much else. A member of the Royal Irish Academy, he is currently researching the Orange Order in its international context. His next book is to be a biography of the poet Louis MacNeice's father, in which the personal impact of the war on a pacifist clergyman is a major theme. It also apparently will challenge the widely held portrayal of the father as a tolerant if puritanical Southerner, courageously opposing all forms of sectarianism and violence, abhorring both revolutionary republicanism and Ulster Unionism, and supporting Home Rule. His lecture was entitled Yeats and Sligo which might sound like a gentle stroll through the various parts of the county name checked by the great poet ending up "under bare Ben Bulben's head" but it was anything but. 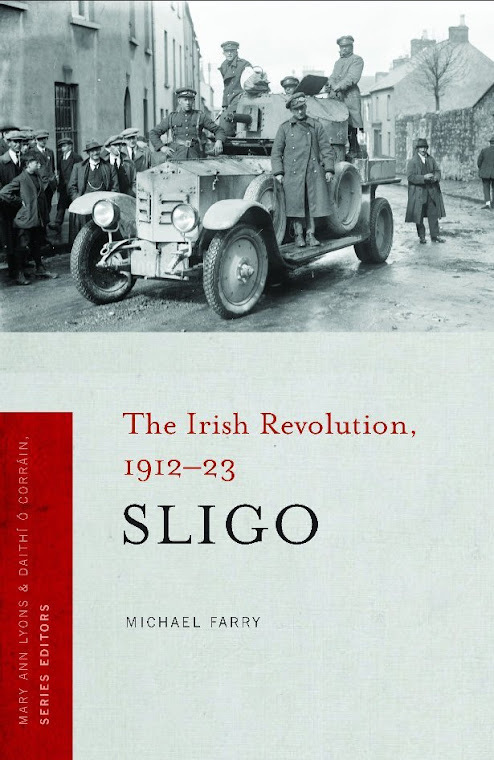 Fitzpatrick questioned the extent to which Sligo actually played a significant part in the Yeats' family history in W B's own youth. He discussed the various families, the Pollexfens, the Middletons, the Yeats themselves and their status in Sligo society. As might be expected from such a historian he was strong on facts and figures and his lecture emphasised the extent to which Yeats constructed Sligo as a land of imagination. His research on the Orange Order and the involvement of Yeats' Sligo relatives in the Sligo branch led him to surmise that the young Yeats was more familiar with the rituals of the Order than he revealed. He wondered at the poet's choice of Drumcliff as a final resting place since most of his relatives are buried in St John's in Sligo town. He proposed that it was to distance himself from the commercial and merchantile connotations of these families that he chose the churchyard where "an ancestor was rector there long years ago". A most interesting lecture which was well received. I went to Sligo last Wednesday and took in two lectures in the Yeats Summer School. First time in its fifty years I attended any Summer School event. That's what retirement is for! 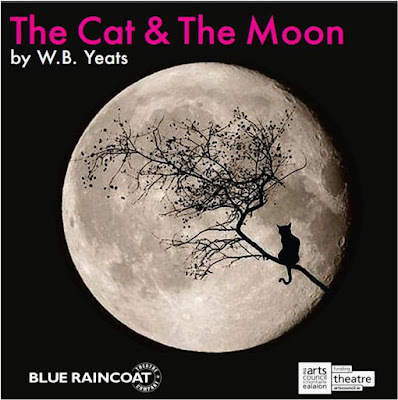 I also attended a lunchtime performance of Yeats' The Cat and the Moon by the Blue Raincoat Theatre Company in the Factory Performance Space on Quay St Sligo. This was my first time visiting this very impressive theatre space located in what was Denny's factory. I talked to a man who remembered visiting the factory with the son of a worker and being shown around. He remembered seeing pigs being slaughtered in what is now the foyer and the theatre. The Cat and Moon is one of Yeats' mask plays loosely modelled on the ritualized Noh theatre of Japan. Actors wear masks, there is chorus of musicians and the setting is spare without props. Movement, music and dance is important. blessedness or a physical cure. Each has to make a choice which will of course have consequences for both. The minimal setting was very impressive and the performance enjoyable, a great way to spend a lunchtime. The lunch was excellent as well! The capacity crowd enjoyed the forty or so minutes. The performances will take place from 1.10pm daily from August 4th to 15th with lunch available from 12.45 at The Factory. Further information is available from Blue Raincoat Theatre Company on 071 917 0431 or by visiting the website. 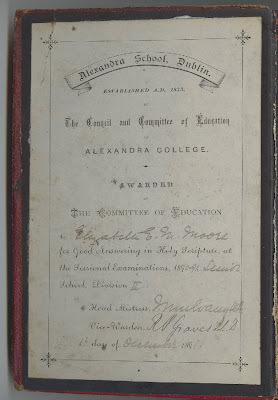 And finally as regards the Alexandra College book plate I've been dealing with - What about the recipient of the book award, Elizabeth E M Moore? I didn't hold out much hope of finding out anything about her but on a quick search in the 1911 census I found what could be the same lady. I did a search for Elizabeth Moore in Dublin. You can specify an age range plus or minus 5 so I guessed she should be around 36 by 1911. I only considered Church of Ireland persons. In 145 Leinster Road, Rathmines & Rathgar West, Dublin we find Kathleen M Moore, single, aged 50 and her niece Elizabeth E. M. Moore, single, 34. Under Rank or Profession they first written None then added Income from dividends. Both were Church of Ireland and they had a servant named Teresa Behan who was a Catholic. All three had been born in Dublin. Elizabeth's initials have been incorrectly rendered as T M in the transcription of the form. I bought the Tennyson second hand in 1967 or 68. She would have been 90 by then. It is tempting to think of her surviving until then, with no close relations and her library being sold to book dealers. The book is well worn, the front cover is detached, though there are no signatures or notes anywhere in it. When the 1901 census is online it will be possible to check her whereabouts then. One could also check Alexandra College records, if they still exist, for her background and progress. The great thing about this little exercise in investigation is how easy it is now that so much is available on the internet. I spent many hours in archives tediously searching newspapers, census records, official documents most of which can now be accessed from your computer. The census transcription for 145 Leinster Road is here and the image of the completed census form here. 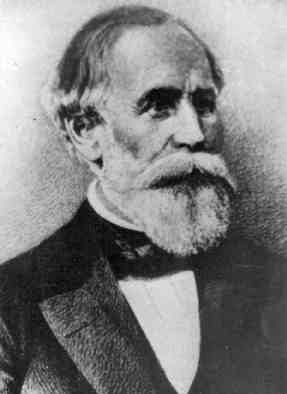 The fact that Isabella Mulvany, Head Mistress of Alexandra College, was the elder daughter of a Christopher Mulvany who had been Civil Engineer of the Grand Canal company and formerly of the Board of Works suggests that she was related to the famous William Thomas Mulvany (1806-1885). When I spent three weeks in Gelsenkirchen (more here) in the German Ruhr Valley in the early 90s I was told of this man who was responsible for the development of the coal mining industry in the area. He had worked with the Board of Works in Ireland before and during the Famine but left Ireland for Germany afterwards. On St. Patrick’s Day, 1856 the coal mine named Hibernia was opened in Gelsenkirchen amidst great pomp, and two more, the Shamrock and Erin, were to follow, all highly successful. A street in Gelsenkirchen was named after Mulvany and there was a beer called after him as well. Soon afterwards a TV documentary made him better know in Ireland and a biography was published later. William Thomas Mulvany was the eldest son of the landscape artist and portrait painter Professor Thomas J. Mulvany, RHA. Another son of the artist was George Francis Mulvany who also became an artist. He also became a member of the RHA became the first director of the National Gallery of Ireland in 1862. A very distinguished family and it appears likely that the famous Isabella was one of them. This week sees the bicentenary of the birth of Alfred Lord Tennyson (1809-1892 ). Information here and you can actually hear him read some of The Charge of the Light Brigade here. Sometime around 1967 I bought a cheap second-hand volume of the complete poems of Tennyson, published by MacMillan in 1891, in one of those bookshops on the quays in Dublin. I have it still though I don't think I ever actually read much of it. 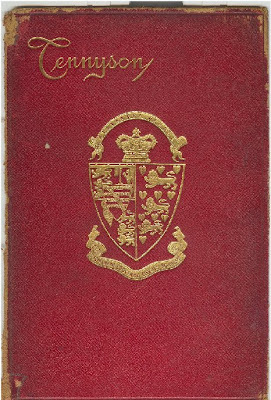 Recently I took it down and noticed that the cover had been embossed with the crest of Alexandra College, Dublin and inside the cover was a certificate - awarded as a Scripture prize in Alexandra College, Dublin in 1891. The school crest has been changed since 1891 it appears. I was especially interested in the signatures on the certificate. The Isabella Mulvany, who was headmistress from 1881 to 1927, was a well known figure in the history of education in Ireland. She was among the first group of women to obtain university degrees in Ireland when she and eight others were awarded degrees from the Royal University of Ireland in 1884. She is mentioned in Women in Ireland, 1800-1918 By Maria Luddy. To mark the admission of women students to the degrees of the Trinity College University in 1904 the honorary degree of LL.D. was conferred on a number of women including Isabella Mulvany in June 2004. Trinity College still awards a scholarship for a pupil of Alexandra College, value €508 a year for two years. 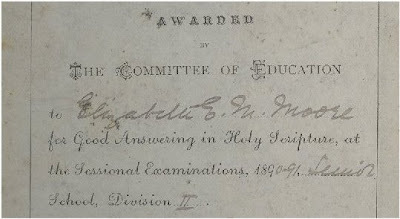 This was founded in 1928 by subscription by the pupils and friends of Isabella Mulvany, to mark their appreciation of her labours on behalf of higher education. Isabella Mulvany was also the great-aunt of the poet Richard Murphy. Isabella Mulvany was the elder daughter of the Christopher Mulvany who had been Civil Engineer of the Grand Canal company and formerly of the Board of Works. Alexandra College has been in the news recently. Was it Socrates who said "Anything which is believed by most of the advertisement reading public most of the time must be wrong"? Possibly not but it's a good maxim all the same and one which I strongly hold. Last week for instance the belief that if it's natural/organic it must be better for your health was scuppered by the UK Food Standards Agency when they published a report that examined the different nutrient levels found in crops and livestock from both organic and non-organic farming. The study also looked at the health benefits of eating organic food - and decided that there were none. The study, which took the form of a ‘systematic review of literature’, was carried out by the London School of Hygiene and Tropical Medicine. Their team of researchers reviewed all papers published over the past fifty years that related to the nutrient content and health differences between organic and conventional food. This systematic review is the most comprehensive study in this area that has been carried out to date. Report in Thursday's Irish Times here. Comment in today's Observer here. Discussion in the wonderful Bad Science column in Saturday's Guardian here. 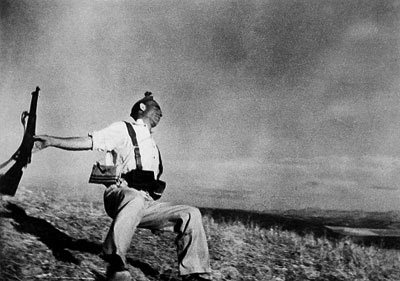 And then there was the claim that the iconic Robert Capa Spanish Civil War photograph - the soldier falling to his death, arms splayed out behind him, gun still in hand, after being shot on a grassy hill - was faked. Story with evidence in the Daily Mail here. Report and comment in the Independent here. I think we have to be very suspicious of images that purport to "capture the essence" of some event. It is too easy to fake these images and anyway there events are far too complicated to be captured in one image. Which poet was it who wrote "Words alone are certain good"? "use your ears as a tape recorder and listen to people the whole time"
"If you get lost I won't look for you"
but I pretended I hadn't heard.